As plants take in sunlight and carbon dioxide to grow, they also respire or “breathe” out part of that carbon dioxide back to the atmosphere. When this occurs belowground from the plant’s roots, it’s called root respiration. All of the microbes and other organisms belowground also respire carbon dioxide back to the atmosphere. Combined, this is called soil respiration. Scientifically, the portion that comes from plants is termed autotrophic respiration, while everything that comes from soil microbes and other fauna, is called heterotrophic respiration. Partitioning is the act of separating how much carbon in soil respiration is coming from plants vs. everything else. One of the ways scientists do this is by looking at the isotopic signature of the carbon dioxide coming from the soils. Isotopes are simply different flavors of the same element—they will have the same number of protons, but different numbers of neutrons. If there are more neutrons than the regular flavor of an element, that is a “heavy” isotope, and if there are fewer, that is a “light” isotope. By looking at the relationship, or the isotopic signature, of the light to heavy isotopes in a substance, we can find out some remarkable things. New research in PLOS ONE from Diego Riveros-Iregui, Theresa Lorenzo, Liyin Lian, and Jia Hu, shows that by using this technique in the soils the Rocky Mountains, we can learn a lot about how plants along the mountain slopes respond to drought and in turn, better understanding the carbon cycle. This research was conducted in the Stringer Creek Watershed, located in the Tenderfoot Creek Experimental Forest, an area of long-standing research in how carbon and water cycles interact in mountain landscapes. 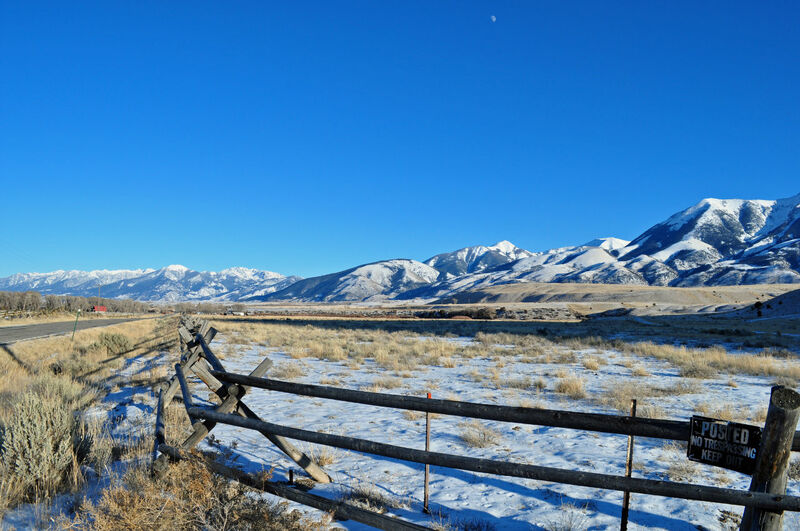 In the western United States, winter brings snow to the Rocky Mountains. During the spring this snow begins to melt, the rivers and the streams swell, life awakens, and flowers and trees begin to bloom. This happens slowly at first, but eventually culminates in an explosion of color and abundance. While this is the most productive period of the year for plants and animals, what often goes unnoticed, is that the water that moves through this system is slowly disappearing during the summer. The vast majority of water that enters the Rockies falls as snow during the winter. Plants need water. And in the Rockies, as in many mountains around the world, they get this water from the soil. The water enters the soil as the snows melt. As the snow on the tops of the mountains melts away, water slowly leaves the system, resulting in a dry-down. The higher areas dry much quicker than downslope areas. What results, is a cascade of ecosystem effects as the seasons change. Remember how plants take in sun and carbon dioxide to grow? Well to do this, they need water. Plants that need a lot of water, grow where there’s a lot water, and vice versa. In drier areas, this is why you often see trees growing closer to streams and grasses or shrubs growing farther away. In the mountains, water is also not equally distributed in space or time. Since water always flows downhill, “convergent “ areas—think valleys, hollows, etc.—are typically wetter and more densely populated by vegetation. Conversely, “divergent” areas—think ridges—are often much drier and more sparsely populated. This pattern mostly translates to soil respiration as well. As soil respiration has both a plant and microbial component, with increasing moisture there is increasing growth that translates to increases in soil respiration. To a point. Get too much water, then you actually see respiration go down. Many microbes will shut down when they are constantly submerged in water, but this is also a physics problem. I tend to think of soils as a sponge—there are lots of pores and holes in soil and if those are filled by water, then air can’t move through the soils. Two things end up happening. One, you shut down all the stuff that is respiring; and two, you close up all the pathways where that respired carbon dioxide could move through. In this study, researchers wanted to understand not only how the production of soil respiration responds to the seasonal loss of water during the summer, but how exactly the composition of the carbon dioxide that makes up that respiration is changing. This is done by looking at the isotopic signature of the carbon dioxide. Key point here. When plants experience drought, they begin to close their stomata, the little pores on leaves that let air in, and water out. When they do this, they are still letting in some air (and consequently the carbon dioxide they need to grow) in, and some water out, but what happens is that the machinery inside the plant that actually performs photosynthesis is limited in what it has to work with. Plants prefer carbon-12 (C12), the lighter isotope of carbon. But when affected by drought, the plant can’t be as picky, and will use more of the heavier carbon isotope, carbon-13 (C13). This process is called fractionation and if you look at the relationship of C12 to C13 in plant tissues, you can see these ratios. That is the isotopic signature. And the isotopic signature of plants that experience drought is to have greater amounts of C13 to C12. Through a microscope, we can see plant stomata (in green) on the underside of a leaf. When stomata become water-stressed, the begin to close, limiting water and carbon dioxide from enter, and oxygen from leaving, a leaf. Most carbon in the atmosphere (99% of it) is C12. However, from isotopic signature, we can learn a lot. What researchers did here, was compare the C12 and C13 in the soils, to see how they change over the summer. The really cool thing here is given how quickly the sugars made in leaves move through a plant, the actual signaturethat comes out of the root as respiration is the same as photosynthesis. If a plant is currently water-stressed, the signature you measure will show it. By looking at these measurements over time, you can isolate the effect of the drying mountain, that loss of water in the soil, and see the response from the plants as the isotopic signatures of soil respiration change. What Riveros-Iregui and colleagues found, was that as the soils dried down, the isotopic signature became more positive, indicating more preference for the heavier carbon isotope, C13. They also looked at different areas of the landscape, comparing areas higher on the mountains, with greater topography (upland) to areas of greater convergence, along streams (riparian). Measurements in this area continued the trend, showing wetter areas to have a more negative signature than drier areas. An interesting aspect of this work is showing this response to water-limitation over time, but doing it through space showing that different areas of the landscape respond to this change in moisture over time differently. Understanding how our changing climate interacts with responses from soils and plants is a vital area of inquiry for science, but mountainous areas are often understudied or under represented. As Riveros-Iregui and colleagues show here and in past work, different areas of the landscape respond differently and do so in different ways at different times. While on one hand this does complicate things when trying to create models of how carbon and water move through systems and in turn forecast how these processes will be affected by climate change, it also highlights the need to more thoroughly study mountain ecosystems, especially those in dry areas or those where snow is the primary water source.